This is not a recipe, but I had to post how tasty and easy this chicken was. The hubby went grocery shopping (Oh how I love that Man) and picked this lovely chicken that was already pre-seasoned. All you had to do was pop it in the oven, and in 45 minutes you had this tender and juicy roast. I highly recommend this for busy Moms or someone whose always on the go. 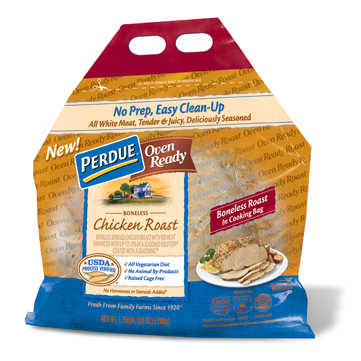 Check your local grocery store for the Perdue chicken roast. I'm all about semi-homemade, lol!! This sounds good Dana! I'm gonna have to try this on one of those nights when I don't feel like going all out in the kitchen. For another semi homemade treat, check out my Easy Breezy Shrimp Fettuccine Alfredo Recipe on my blog www.inthekitchenwithbridget.blogspot.com.